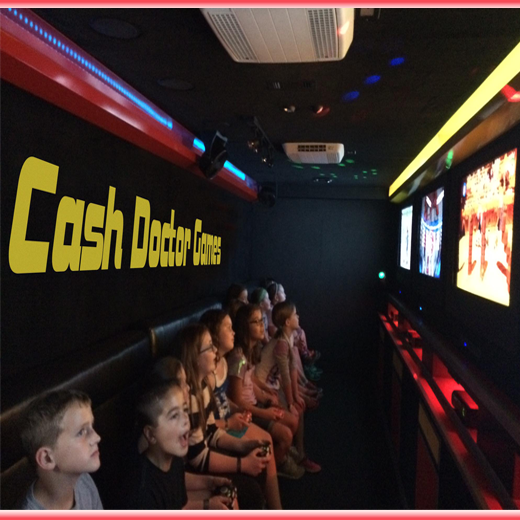 Our state of the art mobile game theaters are the star of every party and guaranteed to amaze! Imagine playing the hottest video games like Guitar Hero, Madden Football and Call of Duty on huge plasma screens in a climate controlled gaming utopia. Now picture all of that plus multi-player game play, surround sound audio, laser light effects and fog machines and you’ve got an experience they’ll never forget! A Video Game Party is just one of the exhilarating activities available at your CashDrGames mobile entertainment event. Join the thousands of satisfied kids, teenagers and grown-ups who have experienced the thrill of our heart-pounding activities at birthday parties, corporate events, summer camps and more. Book your event today!